"A highly significant film for our times dealing...with an individual's search for autonomy." Studs Terkel, author of "Working"
A much-loved film about a remarkable couple. 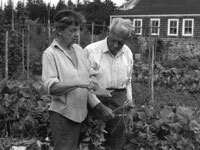 During the Great Depression Helen and Scott Nearing quit city life and moved to Vermont. He was a brilliant economist, she a concert violinist. Together they made Forest Farm synonymous with the ideal homestead. In the noble tradition of Thoreau, Scott was an influential figure in American life for nearly 70 years. Scott died in 1983 shortly after his 100th birthday, Helen lived into her 90's. Filmed in 1976 when Helen was 74 and Scott 93, the Nearings are seen still growing their own food, cutting firewood for fuel, and putting the finishing touches on a large stone home built by hand. Through their books, public appearances, and by the example of their lives, the Nearings remain an inspiration. "I found it terribly moving. A highly significant film for our times dealing as it does with an individual's search for autonomy." "The maverick couple make excellent subjects; the film vividly presents their lifestyle and ideal...It would spark interesting discussions for the whole system of agriculture in this country and of how one or two people can make a difference." "A fascinating story of two 'elderly' people carrying on an active, fulfilling life." "His laugh and her singing make it magic." A moving portrait of the lives and deaths of homesteading authors, Helen and Scott Nearing. Diagnoses the "disease" of materialism and prescribes its antidote, simple living. Simple living and its rewards. A program about stress. How we can overcome being over-worked and out of time? Three 50-minute programs on creating sustainable cities, food systems, and lifestyles. John Jeavons demonstrates biointensive agriculture as a way to alleviate world hunger.